In primary schools I find that spreadsheets are often glossed over, staff often aren’t aware of the power of spreadsheets in modelling and performing repetitive calculations and they can’t think of appropriate examples. Likewise, food security is an issue that is hardly touched on, it is seen as a difficult concept and a political one. Recently I was working with a school studying World War 2 and they had several propaganda posters on their walls including “Dig for Victory” and appeals for scrap metal to build more ships. WW2 saw Britain being blockaded by the Germans, u-boats were sinking our cargo ships and huge quantities of food, along with ships and lives, went to the bottom of the sea. As the recent Wartime Farm program has reminded us, Germany was trying to starve us into submission and our farmers had to grow as much food as possible if our population was going to survive long enough for us to win the war. Food security then was about growing enough food in a resilient and sustainable way, an issue which we are becoming aware of again as we wreck our ecosystem. Besides farmers, local people turned every green area over to food production, parks, school grounds, gardens and even grass verges – something we see happening today in places like Todmorden and is now beginning to happen here in Leeds. The task I set some pupils in year 6 was to look at the school grounds, identify areas that would be easy to grow potatoes, measure these areas and calculate how many potatoes we would need to plant the areas up and the cost of the seed potatoes. 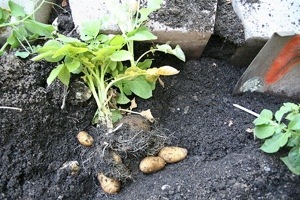 This they managed very well with a little help from Mr Google who supplied the price of seed potatoes. Two of the pupils then wrote reports to the head asking her for the funds to buy the potatoes! You can see their reports on their class blog.